First birthday celebration, First birthday ideas. Kids first birthday party. The first birthday celebration is truly an important event in the parents life after the wedding. This wonderful occasion comes only once in a lifetime for you and the child. It is up to you as parents to really make the very best out of this occasion. There is lot of planning and preparations involved to host a successful birthday party and here we are going to provide you the tips and ideas to make it a grand success. As a first step, make a list of the guests and the number of children who may attend the party. Make sure that you have lots of kids to really brighten up the occasion. Once you have this list ready, you can decide on the menu for the party and segregate the guests to Vegetarian and Non-vegetarian to arrive at an approximation of the food items that is required. Next, it is time to make the invitations. Please be creative with the invitations and carry an informal theme. The invitations come in all shapes like balloons, butterflies and cartoon characters. You can also use the invitation to convey the details of the event, the place and the time and if there is a theme for the party. Send out the invitations and make sure that you do this at least a week in advance. If you are using a catering service, place the order and make sure that they stick to their word. You can also order the birthday cake around this time. You can again be creative here and have the cake made in fancy shapes. Other items required for the first birthday celebrations. Party hats or crowns and masks. Small disposable plates and napkins. First birthday candle. Go for the musical fancy ones. Return gifts for the guest children. On the day of the first birthday celebration, decorate the party hall or place and make sute it looks festive. 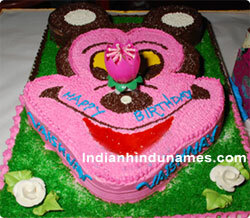 Pink and white balloons for girl babies and blue and white balloons for boyl babies are generally used. Make sure you have planned some birthday party games for the guest kids for lot of laughts. You can visit our birthday party games page for ideas. Hope you have a truely wonderful first birthday celebration. Also find out how many days are left for Birthday using our calculator.